Popeye Jones played for seven teams during 11 seasons in the NBA, being a good teammate, doing the dirty work and soaking up knowledge — which helped him land an assistant-coach gig with the Brooklyn Nets. But his three sons didn't carry on his lifelong love affair. They're all accomplished hockey players, especially 17-year-old Seth Jones, who very well might be the top overall pick in the 2013 NHL draft. Jones has been the youngest player on the U.S. Men's National Under-18 Team the last two years, helping them to consecutive gold medals in the world championships, most recently last month. His size, skills and instincts placed him among the nation's most sought-after college recruits, a 205-pound silky-smooth skater standing 6-foot-3. But Jones decided to take a different route to an eventual pro career, opting to join the Western Hockey League instead of an NCAA program. According to the College Hockey Blog, Jones is "one of the rare prospects that the college game will be worse off for not getting a chance to experience, but also one of the rare prospects whom you can't blame for making the decision he did, even as biased as we college fans can be." Most folks probably assumed Jones would the target of college basketball coaches, but he chose hockey as a grade-schooler in Denver when his dad played for the Nuggets. 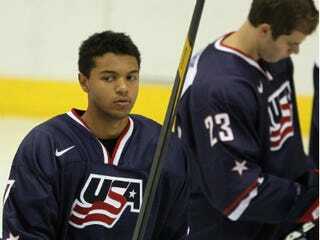 Instead of playing right away, Jones took skating lessons for a year, and soon set his sights on playing for the U.S. National Team Development Program. "Since I was 12 years old, I wanted to play for the NTDP," he told USA Hockey magazine. Once the invitation was extended is "probably when I really decided I could maybe make a career out of it," said. Despite his prowess as a hockey player, Jones can't escape references to his father and questions about basketball. He understands that it comes with the territory. "You know, it's typical," he said. "If I were a reporter, I'd probably ask the same thing. I don't get sick of it, but it definitely comes around a lot." "It'd be awesome, however far I go in my career, to eventually be known as 'Seth Jones' and not 'Popeye's son,' " he said.